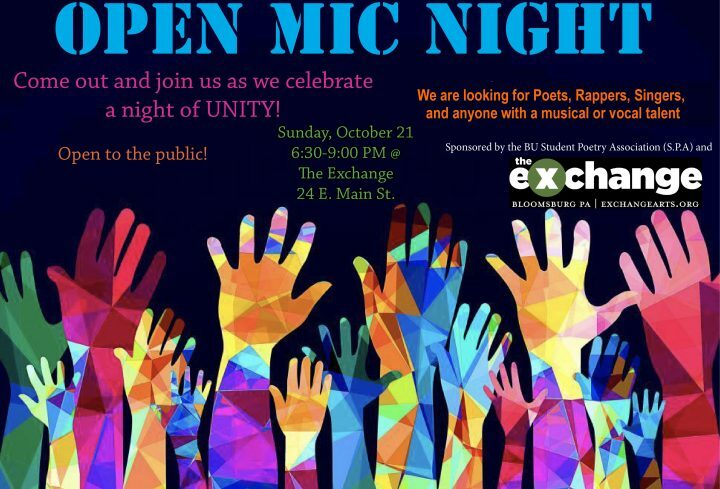 The Bloomsburg University Student Poetry Association (SPA) and The Exchange have teamed up to host an Open Mic Night at The Exchange, 24 E. Main St., on Oct. 21. The event is open to the public and they are looking for poets, rappers, singers/musicians to come out and express themselves and their art. The Exchange is a program in Bloomsburg designed to increase art interaction. They have a gallery, they host arts and music festivals, and sponsor an Art Cart that travels to local childcare centers and nursing homes, giving many the opportunity to create art. The Open Mic Night was inspired by the Beyond the Fountain event last semester where individuals came together to talk about tensions between students and the town regarding issues such as race, sexuality, and other identity components. The event’s goal is to inspire a feeling of unity among students and townspeople and to create a sense of community. If anyone is interested in carpooling to the event, contact the SPA at their Facebook, Twitter, or Instagram.